1) Enable: Enables/disables this trigger to determine if an item is a buy or reject. 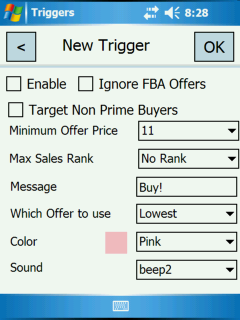 2) Ignore FBA Offer: When checked, this trigger will not consider FBA offers. Only Merchant Fulfilled Prices will be used to select the offer price. 3) Target Non-Prime Buyers: When checked, shipping will not be deducted from FBA offers when compared with Merchant Fulfilled offers to select the offer price. 4) Minimum Offer Price and Max Sales Rank: The item’s offer price must be greater than or equal the minimum offer price, and the item’s sales rank must be less than or equal to this Max Sales Rank in order for this trigger to decide this item is a buy. 5) Message: The message that will appear in the Buy Decision section if the item is a buy based on this trigger. 6) Which Offer to Use: The offer price that the program will use to check against the Minimum Price. 7) Color: The color for the Buy Decision section if the item is a buy based on this trigger. 8) Sound: The audio that plays if the item is a buy based on this trigger.